Approaching mid-December and Christmas time, I will take a jump backwards in time to the end of May and the event of Vignaioli di Radda. This was the second year and the second event of the association Vignaioli di Radda. 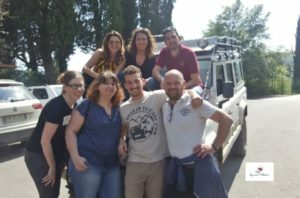 Just as last year, we were a group of wine ‘people’ that were picked up at the train station in Florence by our private driver to head towards the House of Chianti Classico in Radda. 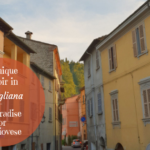 I now see this as a yearly event where the wineries in Radda with the support of the Consortium of Chianti Classico makes it possible for us to learn more about their territory, terroir, and wines. All in a very laid back and fun atmosphere. 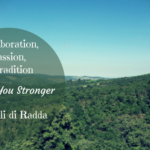 Read more about the founding of the association Vignaioli di Radda and their first event last year in Collaboration, Passion, and Tradition Makes You Stronger – Vignaioli di Radda. Another thing I love about the Vignaioli di Radda is that they each year invite a speaker to hold a short seminar about a subject that is related to winemaking in Radda or to the Sangiovese. But it is not entirely focused only on Radda. They organize this yearly event to showcase themselves but at the same time, they are not afraid to expand their horizons. They try to communicate themselves in different formats both theoretically and more hands on. First out when we arrived in the afternoon, the Vignaioli di Radda team had prepared a fun way for us to experience and learn more about the vineyards and the surrounding forests. We were divided into smaller groups and told to jump up in jeeps that would take each group on a different tour of the vineyards. I was in the group with Bianca Ciatti, Sara Carmignola, Chiara Giovoni, and another guy I can’t remember the name of – sorry! 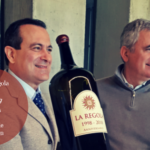 – lead by Bernardo Bianchi from Colle Bereto. We were taken on an amazing tour up to the crest of the hill at the estate of Colle Bereto where we had a view of the surrounding landscape. We passed the vineyards of Colle Bereto, Montevertine, Val delle Corti, and Vignavecchia, among others. We learned that the surrounding forest is very important for the biodiversity in the vineyards in Radda. 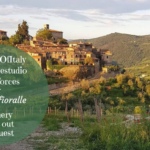 This was also stressed at the event I attended in Modigliana in September, where the vineyards are almost living in symbiosis with the surrounding forest. The other common denominator between Radda and Modigliana is the altitude. The wineries in both Radda and Modigliana have vineyards at an altitude up to around 500 or 600 meters. In fact, I believe Modigliana is at a higher elevation than Radda. In both places, they produce mineral and elegant wines. The difference is that the forest has a higher impact on the viticulture in Modigliana giving wines with a more distinct green and herby touch. After the tour off-road, we settled down in one of the conference room in the House of Chianti Classico to listen to Valentina Canuti talk about research carried out on Sangiovese in Chianti and in California. In fact, her presentation was called “California in Chianti“. 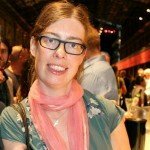 Valentina is a researcher at the University of Florence where she is part of a research project that is carried out in collaboration with the University of Davis in California. Did you know that Sangiovese is not only the most cultivated grape variety in Tuscany but also one of the most common grapes in California? There are indeed about a 1000 hectares of Sangiovese planted and around 100 producers making wine with Sangiovese grapes in California. Valentina explained that she has analyzed 62 samples of Sangiovese from California, Tuscany, and Umbria to try and find common typical traits and authenticate key chemical resources. This sample study has then served as a base to create a model for further analysis and research. At this point, they have found many more similarities than differences between the Sangiovese in California and in Tuscany. If we look at it from a historical point of view, it has been argued that most of the Sangiovese plants were brought over by the emigrants in the late 19th and early 20th century. 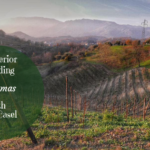 In recent years, the Americans have actively studied the winemaking processes in Italy to replicate the methods at home which have resulted in an upswing and success of the Sangiovese grape in the US, mainly in California. After this interesting seminar on the Sangiovese in the world, it was time to taste the wines in the cloister courtyard. …yes, I am, because it is always such a fun event. 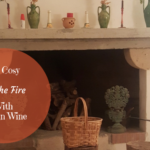 As you might have understood from my short overview of the day with the wine producers of Radda, they always try to mix theory and practice into a fun experience. Learning while having fun is the best of ways, right?